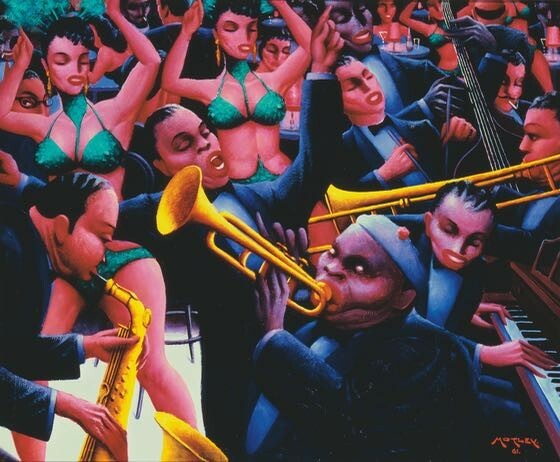 Archibald Motley, Hot Rhythm, 1961. Archibald Motley Jr. was not your average African-American male in 1914. The man who became a world-renowned artist and contributor to the Harlem Renaissance was the son of a Pullman porter and the daughter of a former slave. But in 1914, he became a painting student at the School of the Art Institute of Chicago and studied there for four years. The rest, as they say, is history. Archibald Motley: Jazz Age Modernist is a full-scale exhibit of about 45 of Motley's paintings now on view at the Chicago Cultural Center. Along the corridor leading to the gallery is a display of information about Motley's life and work. Jazz age music plays on the gallery sound system. Motley is best known for the vibrant club and city scenes such as Hot Rhythm (1961), Blues (1929, Paris café scene), and Barbecue (1960). You may have seen his painting Nightlife and an early self-portrait at the Art Institute of Chicago. He depicted African-American elites in many of his paintings but he also showed the lives of the new residents from the South who came to Chicago in the Great Migration. His post-Paris painting, The Picnic (1936), is a scene reminiscent of Renoir's 1881 Luncheon of the Boating Party. Motley's Cocktails (1926) shows elegant black women and Tongues (Holy Rollers) (1929) shows worshipers at an African-American church. He also showed African-American men in social gatherings. Don't miss The Boys in the Back Room (Card Players) (1934), The Liar (1936), and The Plotters (1933). Early in his career, Motley painted many portraits that illuminated the role of African-Americans in middle-class society. Mulatress With Figurine (right) shows a well-dressed woman with a classic figurine, books and a Chinese incense burner. That 1920 painting was awarded the Frank G. Logan prize in 1925 by the Art Institute. He also painted family members, including his grandmother and his wife, Edith Granzo, whose working-class white family objected to the marriage. 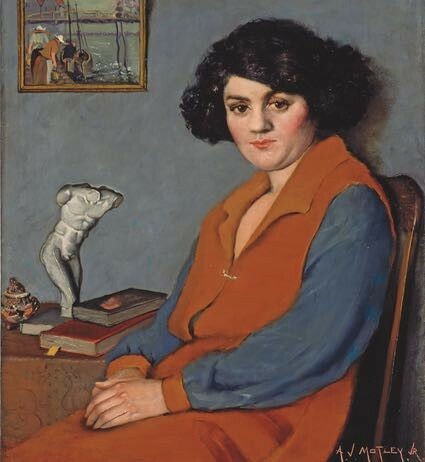 Beginning in the late 1920s, Motley's work was shown in galleries in Chicago, New York and in European exhibits and won many honors over the years. The Art Institute awarded him an honorary doctorate in fine arts in 1980 and he was one of 10 African-American artists honored by President Jimmy Carter at the White House that year. His work also has received many posthumous honors. Motley, who spent most of his life in Chicago, died here in 1981. The Motley exhibit originated at the Nasher Museum of Art at Duke University, Durham, NC., and was curated by Richard J. Powell, professor of art and art history at Duke. In addition to its Chicago stay, it is being exhibited at the Amon Carter Museum of American Art in Fort Worth, the Los Angeles County Museum of Art, and the Whitney Museum of American Art in New York opening on October 2. 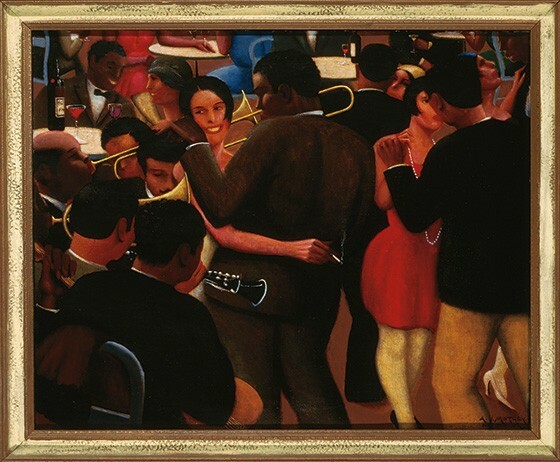 You can see Archibald Motley: Jazz Age Modernist in the Sidney R. Yates Gallery on the fourth floor of the Cultural Center, 78 E. Washington St. The exhibit runs through August 31. Admission is free; hours are Monday-Thursday 10am to 7pm and Friday-Sunday 10am to 6pm. Reposted courtesy of Nancy Bishop from Gapers Blog.